There’s very little that’s as useful genealogically as a school census. Putting children together into a household, particularly in a non-regular-census year, can be the clue we’re looking for when we’re trying to establish relationships or locate missing members of the family. And school census records exist a lot farther back than we sometimes suspect. 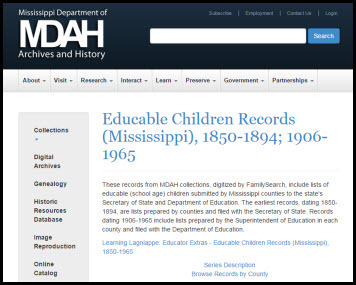 Case in point: the Mississippi record set known as the Educable Children Records. Now think about that 1892 list for a minute — and think about what generally doesn’t exist in the United States: the 1890 U.S. census was largely destroyed in a fire in January 1923.2 That alone can suggest just how useful these records can be. But the name of the record set raises a question: just what exactly does it mean to be an educable child? If we think about it as simply a matter of semantics, we might think it was any child capable of being educated. But this was, as is so often the case, a defined term. And the definition comes from the law. What happened in Mississippi was that a statute was passed in 1850 to provide financial help for local schools and to encourage some of the counties that had lagged behind in creating schools to do so. After the Civil War, the law changed to include all children, not just all white children, and the ages for school eligibility changed to all children between age 5 and age 215 though the enumeration ages didn’t change. “Students between the ages of 6 and 20.” Educable children. Great records. A number of repositories are closing these records to the public from the 1940s to the present time over privacy issues. In the blog post footnotes is a clickable link to the Mississippi Department of Archives and History, to the description of this record group. When you get there, click on the record group title and it takes you to a further description with a clickable link to Browse Records by County. Click on that, choose Coahoma, and then it shows you what years are available online. If they’re not online, you’df have to check with the archives to see if they exist in text format at the archives.